Sagging of the eyelid skin is common. For the upper eyelid, removal of the excess skin is the only effective remedy. 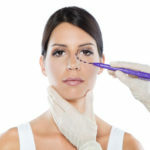 For lower eyelids, there may be non-surgical options such as laser resurfacing, anti wrinkle injections or chemical peeling and Mr Erel would advise you about this. This operation can be carried out under local anaesthesia which will be done as a day case and if some fatty pads are present, they can be trimmed as well. You would need to be driven home after surgery. Fine sticky tapes are applied with regular cooling packs on top which are kept going at home for 48 hours to minimise swelling and bruising. Eyelids heal fast and stitches are removed after 5-7 days (at the Hospital). Problems with healing are very uncommon and bruising is usually gone by 3 weeks, any lingering swelling going soon after. The lower eyelid is more complex. Slight wrinkling in the skin may respond best to chemical peeling or to laser resurfacing. Sometimes Mr Erel uses small amount of anti wrinkle injections to relax the muscle underneath to reduce fine wrinkling. More significant skin sagging and muscle looseness requires eyelid reduction surgically. This operation is either carried out under general anaesthesia. It is better to stay one night after surgery so that cooling packs can be supervised by the nursing staff under conditions of proper rest. You would need to be driven home where cooling packs are continued for 48 hours during which you should rest as much as possible: this is difficult if there is no-one else to support and assist you. Stitches are removed (at the Hospital) after 5-7 days. Problems with healing are uncommon and the scar tends to settle quickly over 3 or 4 months. Light make-up can be worn after 7 – 10 days (as for upper lids).